6 years ago Pru had never stepped inside a gym, and the best sporting result she'd ever achieved was winning the hurdles race in 6th form - against one other opponent who tripped! 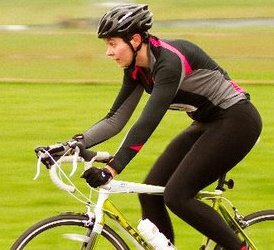 After buying a bike to save money commuting to work, she was hooked on cycling and started going to the gym too. Since then she's not looked back and competed in various half marathons, duathlons, triathlons and sportives. Pru's first exercise qualification was with Spinning® and it's remained her primary passion ever since. Her long term aim is to become a full time Personal Trainer and hopefully soon also a Level 2 Spinning Instructor, and she's dedicated to training and coaching people of all levels of fitness. One of her mottos is "challenge creates strength" and she hopes to challenge the riders at LA Revolution to find new strength in both body and mind.